This website does not offer medical advice. 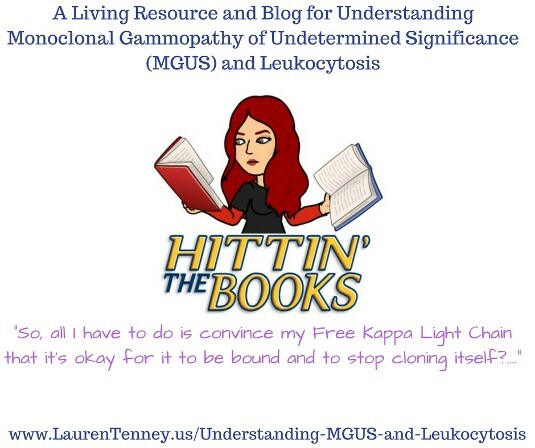 This is a developing website/blog about Monoclonal Gammopathy of Undetermined Significance (MGUS), Leukocytosis, and other Hematology/Oncology issues. Monoclonal Gammopathy of Undetermined Significance and Leukocytosis are two different blood disorders. The resources linked to on this page are resources that I personally have found useful in my journey in trying to understand what diagnoses of MGUS and Leukocytosis mean for day-to-day life of people diagnosed with these or other hematology/oncology conditions, particularly premalignant plasma cell disorders. For selfish reasons, I have a particular interest in understanding M-Protein spikes, over-production of Free Kappa Light Chain, and Free Kappa/Lambda Light Chain Ratio that is out-of-range high. American Cancer Society. (2017). Monoclonal Gammopathy of Undetermined Significance. Website. Retrieved on January 30, 2017 from https://www.cancer.org/cancer/multiple-myeloma/about/what-is-multiple-myeloma.html. Ansell, S. M., Kyle, R. A., Reeder, C. B., Fonseca, R., Mikhael, J. R., Morice, W. G., Bergsagel, P. L., Buadi, F. K., Colgan, J. P., Dingli, D., Dispenzieri, A., Greipp, P. R., Habermann, T. M., Hayman, S. R., Inwards, D. J., Johnston, P. B., Kumar, S. K., Lacy, M. Q., Lust, J. A., Markovic, S., N., Micallef, I. N. M., Nowakowski, G. S., Porrata, L. F., Roy, V., Russell, S. J., Detweiler Short, K. E., Stewart, A. K., Thompson, C. A., Witzig, T. E., Zeldernrust, S. R., Dalton, R. J., Rajkumar, S. V., and Gertz, M. A. (2010, September). Mayo Clinic Proceedings, 85(9), pp. 824 - 833. Retrieved on February 6, 2017 from https://www.ncbi.nlm.nih.gov/pmc/articles/PMC2931618/pdf/mayoclinproc_85_9_007.pdf. Foucault, M. (2003/1963/1973/1976). The birth of the clinic: An archaeology of medical perception. 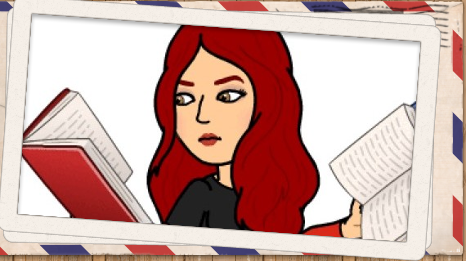 Internet: Taylor & Francis e-Library. Gieseking, J.J. (2013). Where we go from here: The spatial mental mapping method and?its analytic components for social science data gathering. Qualitative Inquiry, 19(2), 712 – 724. Gieseking, J.J. (2007). (Re)Constructing women: Scaled portrayals of privilege and gender norms on campus. Area 39(3), 278 - 286. Goffman, E. (1961). Asylums: Essays on the social situations of mental patients and other inmates. New York: Doubleday/Penguin Random House, LLC. Goldin, L. R., McMaster, M. L., and Caporaso, N. E. (2013). Precursors to lymphoproliferative malignancies. Cancer Epidemiol Biomarkers Prev., 22(4), pp. 533 – 539. Retrieved on February 7, 2017 from https://www.ncbi.nlm.nih.gov/pmc/articles/PMC3616401/pdf/nihms-444216.pdf. Heinrich, M., Fisher, A., Patron, B., McCourt, O., Beeken, R. J., Hackshoaw, A., Wardle, J., and Yong, K. (2016). Lifestyle in Multiple Myeloma – a longitudinal cohort study protocol. BMC Cancer, 16:387, pp. 1 – 6.
International Myeloma Foundation. (n.d.). Understanding MGUS and Smoldering Multiple Myeloma. Pamphlet. Retrieved on February 6, 2017 from https://www.myeloma.org/sites/default/files/images/publications/UnderstandingPDF/u-mgus_smm.pdf. Korde, N., Kristinsson, S. Y., and Landgren, O. (2011). Monoclonal gammopathy of undetermined significance (MGUS) and smoldering multiple myeloma (SMM): novel biological insights and development of early treatment strategies. Blood, 117(21), pp. 5573 – 5581. Kyle, R. A., Remstein, E. D., Therneau, T. M., Dispenzieri, A., Kurtin, P. J., Hodnefield, M. S., Larson, D. R., Plevak, M. F., Jelinek, D. F., Fonseca, R., Melton, III, L. J., and Rajkumar, S. V. (2007). Clinical course and prognosis of smoldering (asymptomatic) multiple myeloma. The New England Journal of Medicine, 356(25), pp. 2582 – 2590. Landgren, O., Kyle, R. A., Pfeiffer, R. M., Katzmann, J. A., Caporaso, N. E., Hayes, R. B., Dispenzieri, A., Kumar, S., Clark, R. J., Baris, D., Hoover, R., and Rajkumar, S. V. (2009). Monoclonal gammopathy of undertermined significance (MGUS) consistently precedes multiple myeloma: A prospective study. Blood, 113(22), pp. 5412 – 5417. Online DOI: Retrieved on January 30, 2017 from https://www.ncbi.nlm.nih.gov/pmc/articles/PMC2689042/. Lewin, K. (1943). Defining the field at a given time. Psychological Review, 50, 292-310. Mayo Clinic. (1998 – 2017). Anemia. Website. Retrieved on January 30, 2017 from http://www.mayoclinic.org/diseases-conditions/anemia/home/ovc-20183131. Mayo Clinic. (1998 – 2017). Neutropenia (low neutrophil count). Website. Retrieved on January 30, 2017 from http://www.mayoclinic.org/symptoms/neutropenia/basics/definition/sym-20050854. Mayo Clinic. (1999 – 2017). Thrombocytopenia (low platelet count). Website. Retrieved on January 30, 2017 from http://www.mayoclinic.org/diseases-conditions/thrombocytopenia/basics/definition/con-20027170. Mayo Medical Laboratories. (2006). Monoclonal Gammopathy of Undetermined Significance, Waldenstrom Macroglobulinemia, AL Amyloidosis, and related plasma cell disorder: Diagnosis and treatment. Communique, 31(11), pp. 1 – 11. Mayo Foundation for Medical Education and Research (MGMER). Retrieved on February 7, 2017 from http://www.mayomedicallaboratories.com/media/articles/communique/mc2831-1106.PDF. McMaster, M. L. and Landgren, O. (2010). Prevalence, clinical aspects, and natural history of IgM MGUS. Cytometry Part B (Clinical Cyometry). 78B (suppl. 1), pp. 891 – 897. Retrieved on February 7, 2017 from http://onlinelibrary.wiley.com/doi/10.1002/cyto.b.20550/epdf. National Institutes of Health Clinical Center and National Cancer Institute (2017, January 24). Natural History Study of Monoclonal Gammopathy of Undetermined Significance (MGUS) and Smoldering Myeloma (SMM). NCT01109407. https://clinicaltrials.gov/ct2/show/record/NCT01109407. Nau, K. C. and Lewis, W. D. (2008). Multiple myeloma: Diagnosis and treatment. American Family Physician, 78(7), pp. 853 – 859. Retrieved on February 7, 2017 from http://www.aafp.org/afp/2008/1001/p853.pdf. Proshansky, H.M., Ittelson, W.H., and Rivlin, L.G. (1970). Freedom of choice and behavior in a physical setting. In Proshansky, H.M., Ittelson, W.H., Rivlin, L.G.. Environmental Psychology: Man and His Physical Setting. New York: Holt, Rinehart and Winston. Rule, P. and Brant, J. M. (2013). Monoclonal Gammopathy of Undertermined Significance—Making it understandable to patients. Clinical Journal of Oncology Nursing, 17(6), pp. 614 – 619. U.S. Department of Health and Human Services, National Institutes of Health National Center for Advancing Translational Sciences, Genetic and Rare Diseases Information Center (2015). AL amyloidosis. Website. Retrieved on February 7, 2017 from https://rarediseases.info.nih.gov/diseases/5797/al-amyloidosis. U.S. Department of Health and Human Services. National Institutes of Health. National Center for Advancing Translational Sciences. Genetic and Rare Diseases Information Center (GARD). Multiple Myeloma. Website. Retrieved on February 6, 2017 from https://rarediseases.info.nih.gov/diseases/7108/multiple-myeloma. Wadhera, R. K. and Rajkumar, S. V. (2010). Prevalence of Monoclonal Gammopathy of Undetermined Significance: A systematic review. Mayo Clin Proc. 85(10), pp. 933 – 942. Retrieved on January 31, 2017 from https://www.ncbi.nlm.nih.gov/pmc/articles/PMC2947966/pdf/mayoclinproc_85_10_009.pdf.